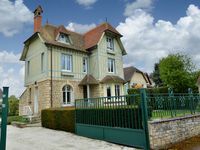 Villa classified 16 people "Les Lucioles"
Property 19: Villa classified 16 people "Les Lucioles"
Great location, close to most of the old city. We enjoyed this property. Several levels of stairs to climb. Would have been helpful to have laundry washer instructions in English as the lady who met us spoke only French and we only English. A dryer for the clothes would have been helpful. Kitchen was adequately stocked with dishes. The coffee maker did not work, but we used the hotpot and brewed French press style. Very secure property. Plenty of room for all eight of us to eat together. Tr&egrave;s agr&eacute;able, bien situ&eacute; et hyper tranquille! 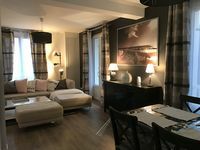 Tr&egrave;s belle maison, o&ugrave; nous avons &eacute;t&eacute; tr&egrave;s confortables tous les 4 (2 couples).